Let’s just get one thing out of the way right out of the gate here – the Buffalo Sabres are not the Pittsburgh Penguins. Not even close. Sabres general manager Jason Botterill moves on from a Penguins organization that has undoubtedly established itself as one of the premier teams in the NHL over the last decade. His fingerprints are all over the blueprint that’s been laid in Pittsburgh. In his many interviews since being hired as the new GM of the Sabres, Botterill has displayed little hesitation in describing what went right in Pittsburgh and how he plans to impart that success in Buffalo. As a well-established salary cap expert, he has made it clear how imperative it is for the Sabres to have depth players on entry-level contracts. Drafting and developing is key. From the Penguins’ Stanley Cup championship last year to their current playoff run this season, their success has hinged on depth players like Bryan Rust, Jake Guentzal, Conor Sheary and Carter Rowney. These players don’t attract the attention that Sidney Crosby, Evgeni Malkin and Kris Letang do, but their presence on the ice is palpable. If the Sabres want to be a playoff team, certain players will need to take the next step. Botterill and the Sabres can rest assured that they have some players in the system to do just that. 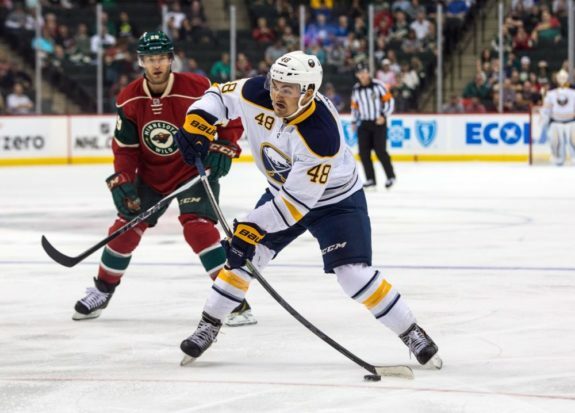 One of the more pleasant surprises for the Sabres last season was William Carrier. Most fans remember him from the blockbuster trade that sent Ryan Miller and Steve Ott to the St. Louis Blues back in 2014. 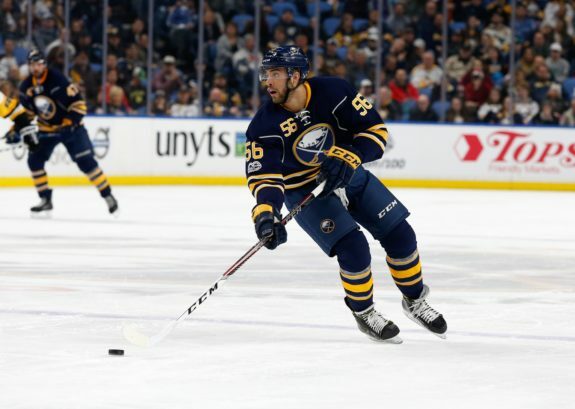 Fans and management probably didn’t foresee him playing with the Sabres last season, but with injuries and an overall lack of speed and skill in the lineup, Carrier got his shot with the big club. In 41 games, he only posted five goals and three assists, but his noticeable speed and grit made up for the lack of production. He trailed only Marcus Foligno in hits-per-game, and finished third in plus/minus, ending the year with a minus-1 rating. Another surprising stat was his Corsi number of 51.39. This ranked him first on the team for forwards playing more than 20 games. One of the more frustrating elements of his game was his ice time, which hovered around nine minutes a game. Only Nic Deslauriers averaged less playing time. Of course, this was dictated by former head coach Dan Bylsma, whose usage and line juggling aggravated fans. Carrier, however, did see some top-line minutes alongside Ryan O’Reilly and didn’t look out of place. A dedicated summer and decent training camp should solidify his spot with the team next season – at the very least a fourth line checking role. Evan Rodrigues, or “E-Rod,” also had a commendable rookie season with the Sabres, so much so that he was awarded “Rookie of the Year” by the players. A former Boston University linemate of Jack Eichel, Rodrigues signed with the Sabres in 2015. Much like Carrier, E-Rod wasn’t projected to play much with the Sabres this past season. With an injured Johan Larsson and a struggling Derek Grant, the Sabres were desperate for a competent third or fourth-line center. Rodrigues filled the void at center seamlessly. The fact that he is a winger, and hadn’t played the center position in about nine years, made his presence on the ice that much more surprising. He only scored four goals and two assists in 30 games, but his speed and defensive awareness earned him a consistent role with the team, averaging 12:55 minutes a night. Aside from a few rookie gaffes and turnovers at the end of the season, he managed to establish himself as one of the more defensive savvy centers on the team, earning some penalty kill responsibilities as well. This should translate to next season as well. It’s now or never for Justin Bailey. After a disappointing training camp last season and bouts with inconsistency, Bailey’s window for a full-time NHL gig is closing on him fast. This isn’t a bad thing though as he’s loaded with potential. The Williamsville native, like his other rookie counterparts on the Sabres, didn’t produce glamorous numbers in the NHL last season. In 32 games, he posted four points, two goals and two assists. But, like Carrier and Rodrigues, his speed and the pace which he can see and play the game earned him a regular spot in the lineup for a large portion of the season. Bailey’s track record in Rochester is where his potential really shines through. In 52 games with the Americans, he potted 23 goals and 36 points. His rookie season with the Amerks was equally as productive, putting up 20 goals and 25 assists in 70 games. Bailey undoubtedly has the tools to play at the NHL level. On any given night he’s one of the fastest players on the ice. His 6’3’’, 215-pound frame is a force to be reckoned with. All he needs to do is take the next step. His success may come down to finding an identity. Is he a first-line scoring winger, or a third-line role player? That’s up to him, however, when he did play top-line minutes with guys like O’Reilly and Evander Kane, Bailey showed why he’s such a highly regarded player. Nicholas Baptiste is the type of player the Sabres are desperate for. The 2013 third-round pick (69th overall) may have only played 14 games for Buffalo last season, but he is the purest goal scorer on this list. He scored three goals and an assist last season for the Sabres, but like Bailey, his American Hockey League stats tell the story of why his ceiling is high. He played only 59 games for the Amerks last season but managed to secure the team-lead in goals with 25. Additionally, his first year pro with Rochester was no slouch either. He scored 13 goals and 15 assists in 62 games in his rookie season. In analyzing Baptiste’s AHL stats in conjunction with his Junior numbers, you can see why there’s such promise for a productive NHL career. His best year in junior was with the Sudbury Wolves, scoring 45 goals and 44 assists in the 2013-2014 season. However, the next season he spent time with both Sudbury and the Erie Otters. Baptiste’s future in the NHL is much like Bailey’s. What will their identities be? Can their blistering OHL numbers translate to the NHL? It’s difficult to tell. But again, this list isn’t one of the Sabres’ top-end prospects, but one of the players that can crack a spot in the lineup and help supplement the contributions of star players like O’Reilly and Eichel. There are other players who may be ready to contribute at the NHL level as well. Hudson Fasching has already seen 17 games with the Sabres and could vie for a spot on the roster right out of training camp. On the defensive side of things, the Sabres have a guy like Casey Nelson who has played in 18 career games. He played very well for us. You can’t get too excited because short term can fool you, but I don’t think he’s fooling anybody. He’s a tremendous skater. He’s got skill. He is what we need. We need our D to get up in the play and become that second wave of attack that we didn’t have much of this year. With all of this in mind, it appears that a formidable blueprint is finally coalescing. The Sabres have two top centers in Eichel and O’Reilly, at least one number-one defenseman in Rasmus Ristolainen, and a wave of both top-end and depth players to round everything out. The Sabres are no Chicago or Pittsburgh, but the blueprint is there folks.